Lesley Finlayson is a Scotland born artist who moved to Canada in 1987 and currently works out of her studio in Vancouver, BC. 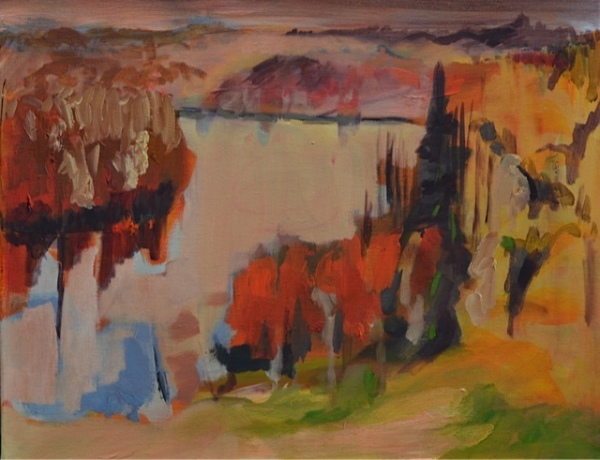 Her work has been collected throughout Canada, the United States, and the United Kingdom, and can be seen in public collections such as Esso Petroleum Canada and Sceptre Resources ltd.
Moving continuously between abstraction and representation, Lesley’s paintings are guided by the dialogue of colour and light that each new place she visits elicits. 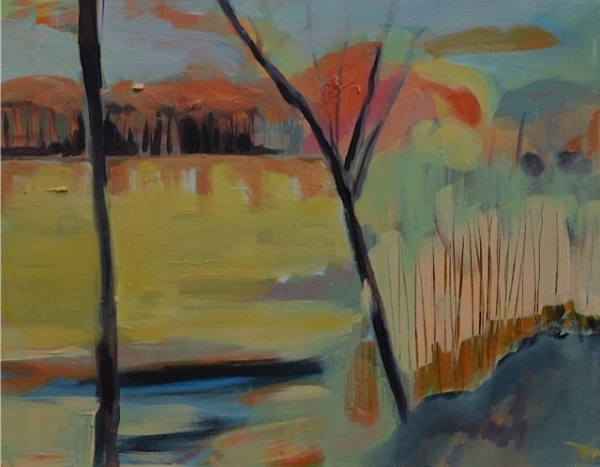 In her new body of work entitled “Culmination”, Lesley captures the intense peak of energy of Edmonton’s River Valley right before the season transition from fall to winter. “It felt like a very vital moment, a final hurrah before all the leaves dropped and the land went to sleep to regenerate for the following Spring”. Each painting hinges on the very tension of nature and the sense of urgency to capture vital elements of colour and form before the energy of the land shifts into hibernation. Lesley continues to push abstraction through her process of creating en plain air studies of the landscape first then interpreting her memories and drawings into large-scale paintings. “By going through the process of drawing and painting on site I approach the final painting with a strong sense of the place. The canvas becomes filled with information and through layers and layers of paint it takes on its own direction and ultimately become its own place”. The viewer is left with a sense of familiarity and remembrance of the sound of the wind in the trees, the crisp scent of leaves decaying, and the sound of churning water of Edmonton’s iconic River Valley. 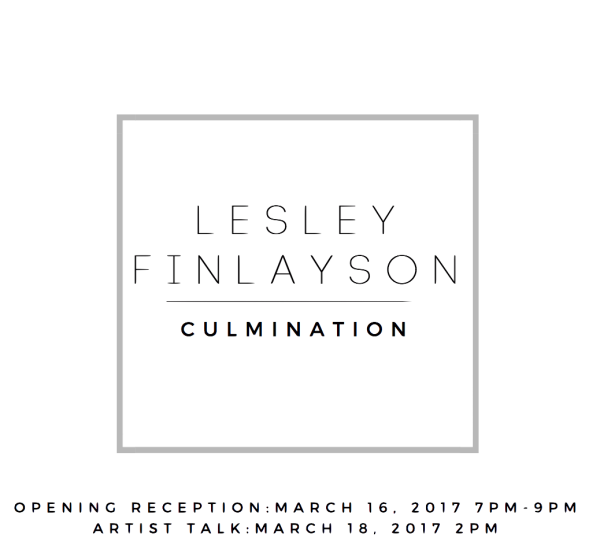 Join Lesley Finlayson March 18th on a tour and in-depth discussion of her latest work Culmination. 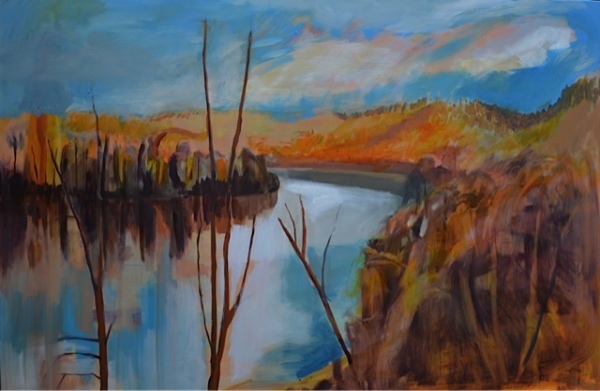 Immerse yourself in Lesley's depiction of Edmonton's River Valley as she speaks about her process and experiences of travelling to different landscapes across Canada in search for light and colour. Artist Talk will begin at 2pm. As the largest urban park in Canada, the River Valley is a natural wonder that is the pride of Edmonton. 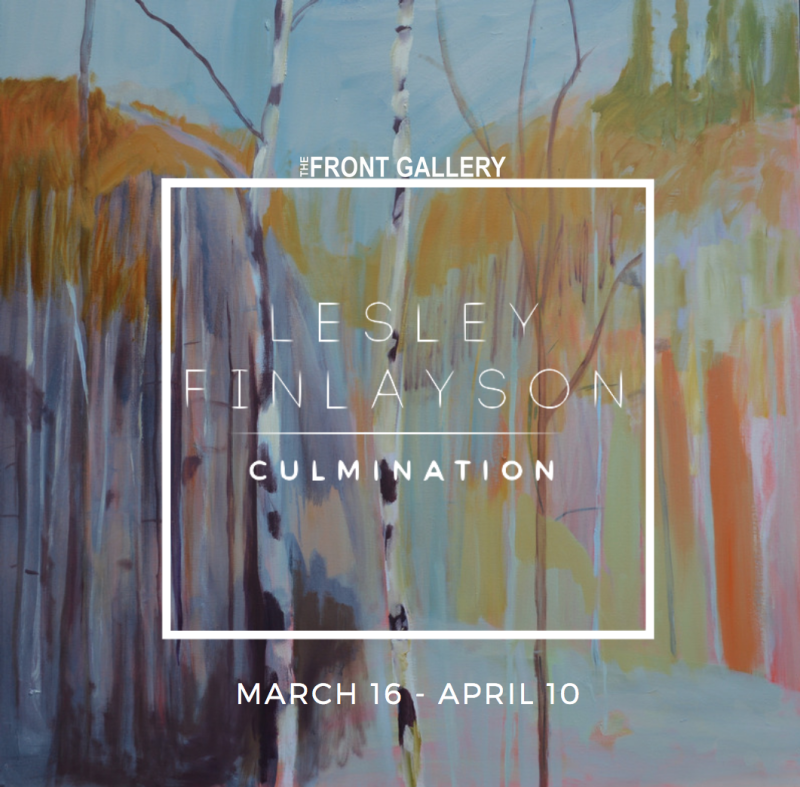 In Honor of Lesley Finlayson's upcoming show Culmination, The Front Galley would like to invite Edmontonians to share their own photos of the River Valley. The winner of the contest will have their photo custom framed and displayed during the July Exhibition at The Front Gallery. Contest ends April 10, 2017.